I read that Ernest Hemingway once made a bet that he could write a six-word short story that could make people cry. This picture is in Lily's scrapbook. It's all her shoes in her nursery, waiting for her. So many adorable, tiny pairs of shoes for a pair of adorable, tiny feet. Are baby shoes not one of the most fun things to buy?! She had more than me. 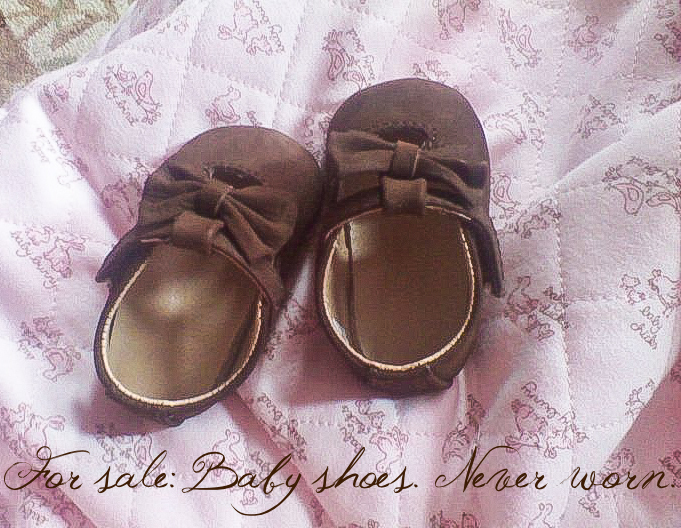 ;) Hopefully I will have another daughter one day to fill her big sister's shoes. Oh my gosh!!!!! Day one of classes this semester in some way shape or form, 5 of my 6 classes managed to talk about dead babies or something related.... my writing theory and processes class? Yeah... the class asignment was to write a 6 word story. And of course.... they told the story behind it. Yeah. I've managed to cry in nearly every class this year.... even had to leave one because I just couldn't hold it back. (insert eyeroll)... I figured if you can't beat 'em, shove it in their face! ;) I have done nearly every paper or presentation on a poem dealing with death/ infant death.... HA! ROAR! :D Don't mess with a woman made strong by burying her babies!!!!! yeah. For Sale: Baby shoes. Never worn. I'm sorry for the delayed response... going through old comments and trying to reply to each one.